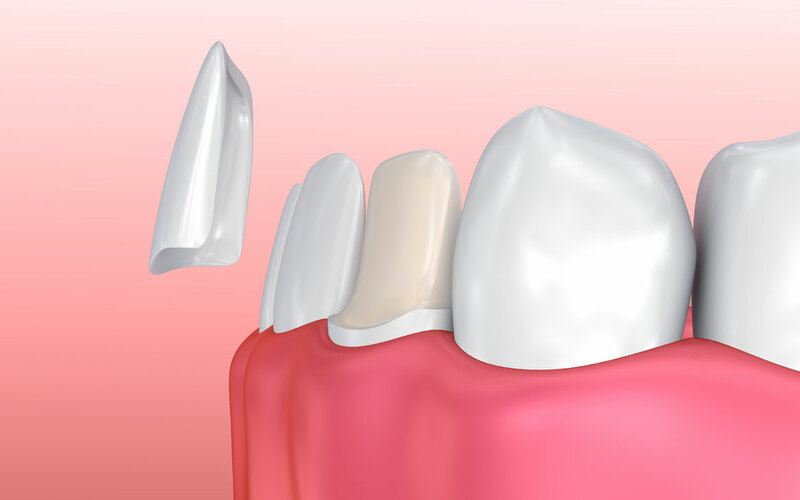 Dental veneers are thin shells of porcelain or resin that are custom made to fit over teeth, providing a healthy and natural look. They can be utilized to fix chipped, stained, misaligned, worn down, uneven or spaced teeth. Porcelain veneers can be fabricated by a dental technician in a laboratory to be bonded to the patient’s teeth in a dentist’s office. They are bonded to the teeth with resin cement. Porcelain material is brittle; however, when attached to the tooth, it can become very strong and durable. A composite resin veneer can be completed in a single office visit while you are in the dental chair. Dental veneers should be cleaned like your own teeth. The longevity of these restorations can be extended if the proper oral care products are used. Flossing once a day, brushing two to three times a day with a fluoride toothpaste, and rinsing with an antibacterial mouthwash will help veneers last for many years by removing food, bacteria, and dental plaque.